Barrel-aged? The Times They Are a-ChanGIN'. The Austrian Spirits wizard Hans Reisetbauer began his obsession with distilling in 1994. On his family farm-house in Axberg he planted the first orchards from which he made his first Eau de Vie. The dedication and care for top quality fruits, distillation and innovation brought him fame and adoration from fans and critics all over the world. The Austrian Tertiary spring water is naturally soft, which means it is a proper bedrock for Spirits production. He is on a constant search for innovation. Barrel-aged Gin isn’t something entirely unprecedented, but it’s an interesting oddity nonetheless. In the times past this was mostly an offshoot of necessity of transport and storage, while nowadays it’s an avant-garde choice for a Spirit usually recognized as fresh and unaged. The big question is – can Gin improve with a little aging? Reisetbauer seems to think so and we thoroughly agree. Reisetbauer 7YO Barrel Reserve is product of triple distillation and 27 botanicals. It was filled in 2009 in a 1000 liter oak barrel and bottled after seven year at 51% ABV carrying an exquisite straw-yellow color. The capacity confinement of the said barrel means this is a limited edition with only 1300 bottles available. The prolonged aging process generates exceptionally complex results. The wood softens the intensity of the botanicals and allows for the wood notes to impart its mark on the drink. Gin is usually a blank slate. The cocktail Spirit that allows other flavors to flourish. Well, not this one. The botanicals give it substance, the oak gives it personality. This Gin doesn’t share center stage; it proudly stands on its own. 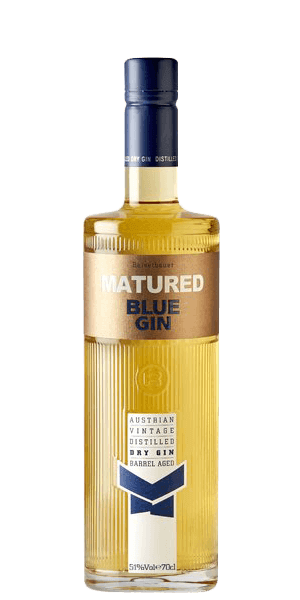 What does Reisetbauer Matured Blue Gin Limited Edition taste like? The Flavor Spiral™ shows the most common flavors that you'll taste in Reisetbauer Matured Blue Gin Limited Edition and gives you a chance to have a taste of it before actually tasting it. Juniper, coffee with a breeze of berries. Oak and spice with sweet vanilla notes. Easy to drink as is anf perfect for mixing. Very nice taste and finish. A delight!